After a recent trip to the grocery store, this is what my fridge looks like. Perfect? No. Far from perfect. I live in a small town. My nearest Whole Foods store is 4 hours away. The nearest chain discount-type big store (that I despise and so I won’t even mention their name but it rhymes with Fall-Apart) is about an hour away. My local grocer is two minutes away. This means that I buy most of my groceries locally. I make trips occasionally to bigger stores, and once in a while to my dream grocers. Since I love cooking with less-processed foods, the local store sees me frequently. My point? Is that it can be done. Gluten free can easily be done in a small town, even with a lack of most of the marvelous gluten free substitutes and a lack of organic produce and meats. I frequently purchase things online. King Arthur Flour is one of my favorite places. I also am ready for spring so I can plant my seeds from Baker Creek Heirloom Seeds. 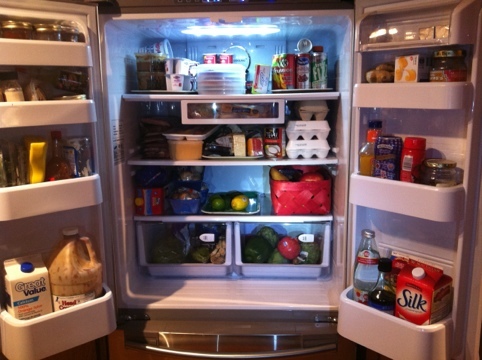 There isn’t a lot of fresh meats in here – I am going today to go pick some up! Anyways. 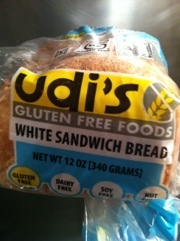 You don’t have to spend a ton of money, or buy every thing in the specialty store just because it says “gluten free”. Find what you like. Visit the local store regularly to replenish your stock of fresh foods. Cook. Experiment a bit. Explore. Have fun with it! Posted in Gluten Free! (Now what?) and tagged gluten free, grocery, new to gluten-free, shopping, what to buy. Bookmark the permalink. The first trip to the grocer’s after being told you cannot have gluten can be a bit intimidating. Or, a lot intimidating. “Gluten? The protein in wheat is EVERYWHERE! Where do I start?! This is SO impossible!” ~Me, seven years ago. Possibly with some dramatic flourishes thrown in. Foot stomps. A few tears? I’ve mostly blocked this from my memory. I promise, it isn’t nearly as scary as you might think. First of all. Which store do you shop? If you have access to a large, organic, natural grocery store such as Whole Foods or Trader Joe’s, then you’re in luck. It will be so much easier to navigate the aisles when you realize that there are actually stores out there that cater to your specific dietary needs. If, on the other hand, you’re like me and live in a small town HOURS away from such wondrous stores of bounty, then don’t fret. It’s still relatively easy at your local small grocery store. The best advice I can tell you is this: know your budget, plan to spend a bit of time, and walk into the store with fresh eyes. You’re going to skip most of the actual aisles here. That’s okay. Don’t panic. This is a whole new ballgame, folks. Sticking to the outside aisles in the store should get you the essentials. These are the main items that you’ll be picking up. BE CAUTIOUS and make sure you read all labels very carefully. The first time, it may take a while. Check out vegetables you’ve never tried, cuts of meat that would be easy to cook, some in-season fruits. Keep to the freshest, simplest forms of food possible in order to avoid added glutens (i.e. choose a 5lb. bag of potatoes as opposed to the refrigerated prepared container of mashed potatoes that contain wheat flour as a thickening agent). The good news? In general, shopping this way will cut your time in the store once you get the hang of it. Lucky you! 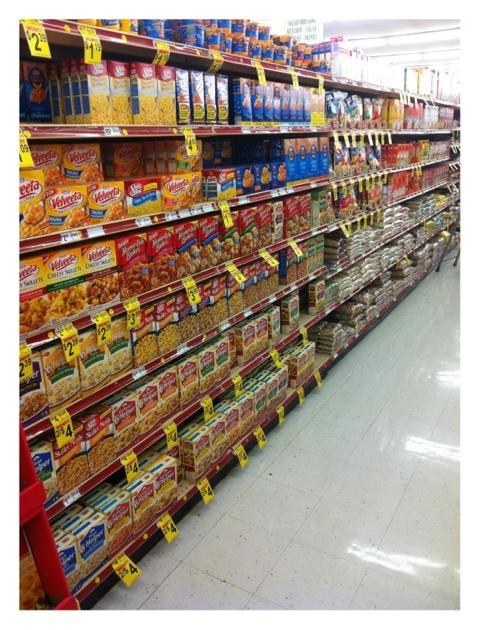 You don’t have to shop all the prepared-boxed-foods-and-bread aisles! Stick to the outsides aisles of the store. See? Easy. Thank me later. One more thing. If you’d like to try some pre-packaged gluten-free foods, have at it. Really. I have a bit of a warning for you though. These foods are often expensive, and searching out the good ones can cost you a lot of (GF) dough. Don’t spent a lot of cash trying to replace your favorite blue box of mac & cheese or your favorite alfredo. Not yet. Ask around for recommendations if you have GF friends, look around the web and GF blogs for raves & reviews, and try a few items each trip. There are a lot of great GF foods out there now. Stick a toe in and start discovering what you like. Makes notes, list your favorites for next time. Contacting the store management and asking if they carry any gluten-free items is a good idea. It has been my experience that most stores, no matter how small, are more than happy to help their customers. You never know; they might’ve been asked about it before and were considering stocking a few GF items. You could be the catalyst that pushes it forward. Posted in Gluten Free! (Now what?) and tagged food, gluten free, grocery store, shopping. Bookmark the permalink.